The Bourbon Boys, that lovable trio of Gator fans that blend humor and football knowledge on their blog into a weekly, profanity-laced must-read during the fall months, have their picks up for the weekend. Just in case you were curious, all three picked the Big Orange to continue the beat down that they started last year against California. Is Mitt Romney a Homosexualist? I am linking to this column by Alan Stang for future reference. Yes, there are a few tidbits of knowledge contained within it, particularly with reference to the connections between Mitt Romney and the Log Cabin Republicans, as well as Romney's anti-Boy Scout stance. However, the real reason that I am linking to this column is as a counterpoint to my own writings. The next time that a Tennessee Republican refers to me as "mean-spirited" or "over the top," I am going to refer back to Stang's column as a frame of reference. MORE: As for my view of the whole Senator Larry Craig debacle, it can pretty much be summed up in Dale Carpenter's piece over on Volokh. Miss Teen South Carolina: "I personally believe the U.S. Americans are unable to do so because, uh, some, uh...people out there in our nation don't have maps, and, uh, I believe that our education like such as South Africa and, uh, the Iraq everywhere like, such as and...I believe that they should, our education over here in the U.S. should help the U.S., err, uh, should help South Africa and should help the Iraq and the Asian countries, so we will be able to build up our future for our..."
Well, I must say that I am stunned. I did find out these nuggets on Lauren Caitlin Upton, who apparently is the fifth best teenage girl in America. She is a big fan of bungee-jumping and riding four wheelers in the mud. No word on if she is a big fan of protective helmets during these activities. Also, if she could lunch with any one person, dead or alive, it would be Lauren Hutton. No, I couldn't even make that up. Fellow citizens of Knox County, I bring to you the unfortunate truth - you are being ruled by those who are not the best and brightest that we as a county have to offer. Yes, you knew they were morally bankrupt based on their actions over the past year. But I bet you at least thought that they might have a clue about the laws of the State of Tennessee, since, you know, they actually produce local law through their positions on the Knox County Commission. Apparently, that isn't the case. Just read the latest from the Knoxville News-Sentinel. Lee Tramel doesn't think that the commission knowingly violated the Sunshine Law. Apparently, Commissioner Tramel believes that ignorance of the law is a defense to it. As someone who deals with criminal clients that believe the same thing, I have to say that judges don't tend to sympathize with the "gee, I didn't know" defense. Lumpy Lambert wants to take the case "all the way to the Supreme Court so we know exactly what 'the Sunshine Law' means." Of course, the courts of Tennessee have already weighed in on the subject. Perhaps Commissioner Lambert should ask the Law Director to provide some case law to read on the side. Any 1L student over at the University of Tennessee College of Law could find it for him, if the Law Director is too busy cleaning up other county messes. Finally, the quorum argument is quite imaginative. Unfortunately, it isn't supported by anything in the law, which tends to be troublesome in front of a judge. It's a sad state of affairs. Things aren't that bad here in Knox County, but can you imagine just how good they could be if our government even approached competency? As y'all know, blogging has taken a massive hit over the past month. I've posted less in August than in any month since I started VOLuntarilyConservative nearly 2 1/2 years ago. Work has been incredibly busy. When I founded The Huddleston Law Firm in 2005, the whole idea was to let me run the show and not have to answer to liberal partners who tend to micromanage their associates without morals or compassion. I wanted freedom, and I had it. For a while, at least. Starting in September of 2006, my calendar became packed with cases, and it hasn't eased up since. I always wondered how my friends at the larger firms like Sidley Austin and Baker Donelson managed to have 2200 or 2400 billable hours and keep their sanity. As it stands now, I will equal their billable hours for 2007 - and I dare say pull in about half of their salaries. Not that I am complaining, as I never would have dreamed that this Firm would be so successful. It just makes finding time for friends and blogging quite difficult. Plus, there is the excitement of expecting our first child. Angela is at 23 weeks and still on schedule for a Christmas Eve delivery. In addition, a personal dream of mine was realized last week. For the first time in my life, I own season tickets to my beloved University of Tennessee Volunteers. While it is true that I have attended over 90% of the games spanning the past 13 years, I have always done so by purchasing tickets or having them given to me by generous friends and family. Not this year, since I have my own pair. To those of you who aren't fanatics of UT football, you may not understand how excited I am, but I have a feeling that there are some out there that just might know the since of pride and fulfillment that I have experienced this past week. In any case, lots going on around here. A source that I trust just told me that Atlanta Falcons QB Michael Vick has negotiated a plea agreement with the U.S. Attorneys in Virginia. Nothing yet on ESPN or CNN yet, but I bet that we'll be hearing details soon. GOP.com has a new game out entitled "Show of Hands." Players try to match the bizarre campaign statements, voting records, and endorsements with respective Democratic presidential candidates. Admittedly, I didn't perform too well (although I pretty much aced anything that Clinton said). Try your luck at deciphering the American Left. Should the Feds Limit Student Credit? David Oatney broaches an interesting topic over at his blog regarding Congressman Duncan's legislation that would limit the amount of credit that can be extended to college students. My first gut reaction was in favor of Congressman Duncan's approach, as the thought of the average college student being able to handle a credit card with a sizable spending limit is truly frightening. However, I started to sour on the bill after reading some of the comments on David's post. Is this a matter of personal responsibility? Are the students "prey?" Interesting questions, for sure. Eventually, I have to come down against the bill, and I blame the education system (the same education system that has achieved fewer results with record budgets under President Bush) in America. College students should be able to handle credit cards. The problem is that we are sending thousands upon thousands of high school graduates to "schools of higher learning" who simply should not be there. College admission standards - as well as college curricula - are poor attempts at humor, only revered by those who probably should have attended a technical school or ventured straight into the work force. I guess after some thought I have to side against this "nanny-statish" idea. People should be able to protect themselves from credit offers. Congratulations to my father for launching a new website based on electrical consulting. If you need any accident investigations or expert testimony regarding electrical engineering matters, give him a buzz. MORE: After all, wouldn't you want a guy with personality enough to have the picture below taken helping you? 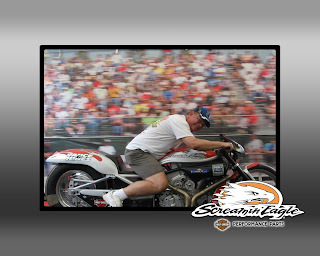 Picture taken at Bristol International Dragway, June 2007. I don't know what to say. I am truly at a loss for words. Earlier today, I published that I did nothing special regarding my birthday, that turning 31 didn't really spark any ideas of birthday celebrations at my advanced age. Then the video hit the Internet. The house Nixon and Reagan built, Bush and Rove tore down, leaving rubble in its place. Rove's failure was a failure of vision. He and Bush believed the future of the party lay in adding to the Republican base the Hispanic vote, now the nation's largest minority, approaching 15 percent of the population. They went about it the wrong way. Pandering to that voting bloc, Bush stopped enforcing the immigration laws and offered amnesty to 12 million to 20 million illegal aliens and the businesses that hired them. Bush and Rove were going to lure the Hispanic vote away from the Democratic Party by putting illegals on a path to citizenship. But as we saw in June, when the nation rose up in rage against the Bush amnesty, the pair did indeed unite the GOP – against themselves, and they severed themselves from the Reagan Democrats and the country. In seeking a new GOP majority, Bush and Rove rejected the Nixon-Reagan model. Instead, they embraced the interventionism of Wilson, the free-trade globalism of FDR, the open-borders immigration ideas of LBJ and the budget priorities of the Great Society. It was a bridge too far for the party base. Now, Rove walks away like some subprime borrower abandoning the house on which he can no longer make the payments. The Republican Party needs a new architect. The firm of Bush & Rove was not up to the job. Buchanan may be a bit biased, as he has the connections to both Nixon and Reagan, but the numbers don't lie. For all of the successes of Nixon and Reagan towards turning this into a conservative nation, Bush-Rove have put us back to square one. It is my opinion that the Republicans can't take anything for granted in 2008 and have to campaign like a new party that has little chance of winning. Basically, we need to play at all points like we're 20-points behind, and we need to campaign everywhere. Nothing can be taken for granted. I suppose that is the Rove legacy - a party that is going to have to scrap and claw for everything if it ever wants to achieve its goals. Sorry, folks, but I decided against posting on my birthday yesterday. I figured that since it was already confirmed last year that I was over the hill, that we didn't really need to go there. I guess I fall into the school of celebrating the big birthdays (16, 21, 25, 30, 40, etc.) and not 31. I guess that is proved by my evening spent of watering the yard, attempting to ascertain UT/Alabama tickets, and dinner at Chick-Fil-A with the VOLConWife. Mike Faulk, the next Senator from Tennessee's 4th Senate District, just launched his Senate campaign website today. Very spiffy, and with a calendar feature that actually works, it already beats most seasoned candidate websites. Read this on the color of the Ames Straw Poll. OK, so how did Ron Paul, who apparently was trying to do well in Ames, only get 9% of the vote? I mean, he had a live monkey, people! Doesn't that just scream presidential material to you? Maybe people didn't like the monkey. Maybe the monkey was mean or threw poo at people. Maybe the people were starting to realize (as I am) that Ron Paul has many good points but also many dangerous positions (such as the appearance that he is being backed by several groups and individuals that want the United States to surrender its nuclear arsenal). I'm thinking that Fred Thompson, John McCain, and Rudy Giuliani were wise to stay away from Ames. Better to stay away from monkeys, Elvis impersonators, and children's inflatable toys for as long as possible. Yes, posting has been nearly non-existent lately. Part of this has been due to too much work at the firm (heck, I had two trials last Friday - a mistake I will never do again). However, part of the slow times here at VOLuntarilyConservative have to do with slow times - period. Nothing much is going on. Yes, the Ames Straw Poll occurred, but no one bothered to show up - either in the way of candidates or voters (participation was down 50% from the last contested Ames Straw Poll in 1999). Knox County has been interesting lately, as the Knoxville News-Sentinel has been resembling an actual newspaper, exposing the multitude of scandals in the Knox County government involving credit card misuse, Knox County Commissioners apparently committing perjury (because, in reading the story, either Paul Pinkston lied under oath or Larry Clark did, as their stories simply don't add up), grant money being handed out to friends and relatives of elected officials, and Knox County's laughable attempts to have the valid lawsuit filed by the KNS regarding violations of the Sunshine Law thrown out of court. But this is a good time of the year for me, too, folks. While I am quite stoked that football season is right around the corner (just 18 days until IT'S FOOTBALL TIME IN TENNESSEE!!! ), it's also that time of the year that I reflect on what has been over the past 12 months. While with the Alliance Defense Fund's Blackstone Fellowship, I met with Dr. Bob Biehl, one of those guys that major corporations bring in to speak with their management staff in order to make them better at their jobs. We spoke on many topics, but one thing has stuck with me through the years - the importance of managing your life through reflection. Now I know that it took me some time to buy into this, and many of you now are probably thinking that it's some new age psycho-garbage. Fair enough. However, I ask this question: how often do you think about where you have come from? I guess I am one of the converted in that I find it hard to plot a path to where you want to go without at least recognizing where you have been. A good deal of my time counseling clients has to do with this very subject, because so many of them are only living in the "now" and have no concept of tomorrow or yesterday. I mention this today because it is my annual time of reflection. Dr. Biehl imparted on me the need to take an annual assessment of my life. While I constantly become too busy (too busy to work-out, too busy to hike, too busy to fish, too busy to spend time with my friends, too busy to blog, too busy to golf...), I intentionally carve out some time around my birthday to just think about what has been and where I need to go. I suppose that many people may do this around New Year's, but it just seems too inconvenient of a time with Christmas celebrations (and with little Baby Huddleston coming this Christmas season, impossible this year) and New Year's plans to achieve any real analysis of your life during that time for me. In any case, with the news cycle being relatively non-existent (with the exception of the Nashville mayoral contest, in which I would have voted for one of these two men) and football being a few weeks away, this is the best time for recharging the old batteries and seeing if they are adequate for the future. Maybe if it cools off a bit, then I might even catch up on some of that hiking, too. Conservative economists have been sounding the alarm for years - our debtor economy is eventually going to be our greatest weakness. China - which holds over $900 billion in U.S. bonds - is now threatening to sell off its U.S. holdings en masse, an action that would devalue the dollar and most likely send the American economy into recession. But here is a question - given our new standards of what constitutes an "act of war" post-9/11, is this economic action a prelude to World War III? And a follow-up question - who else would be on our side against the Communists this time? The Knoxville Chapter of the Tennessee Firearms Association will meet tonight at Bob's Mountaineer Restaurant in Seymour at 7:00 P.M. The guest speakers will be Senator Raymond Finney and State Representative Richard Montgomery. Gun owners, persons involved in the shooting sports, Second Amendment supporters and interested public are urged to attend. YOU DO NOT NEED TO BE A MEMBER TO ATTEND. Pat Buchanan has a tough (although depressing) take on the state of America in his latest column. One point that I would like to make. Buchanan questions how we could pay for improvements in our infrastructure, but he unknowingly gives the correct conservative answer later on in his piece. The answer is by shutting down Social Security Disability - the 21st Century Welfare program. As a classical conservative, I strongly believe that the two primary purposes of the United States government are 1) national defense and 2) infrastructure. This is in-line with the thinking of many of the founders, as well as a few modern day conservatives like Alan Keyes. The government is not here to prop up other regimes. The government is not here to make our citizenry totally dependent on the government for survival. The government is here to provide a safe environment for a free people to create a better life, to celebrate liberty, and to pursue happiness. Do I agree with Buchanan that the sudden focus on the weaknesses of our infrastructure is media-driven and overblown? Yes. However, we need to start realizing that it's more important to keep the dam from cracking than it is for providing free government handouts to the people who live below the dam, just as we need to start focusing on our own dams, bridges, and transportation systems instead of providing the means to do so in Africa, the Middle East, and Asia. We had a wonderful time at the Republican State Executive Committee meeting in Nashville Saturday. As everyone knows, Robin Smith was tapped as the new Chair of the Tennessee Republican Party, with Bob Rial of Dickson winning election to the Vice Chairman's position over East Tennessee radio mogul Ken Hill. The transition of power was a testament to the strength of the Party, although it was sad to see Bob Davis leaving TRP to serve on Fred Thompson's presidential campaign. I felt honored to speak to so many fine Republicans Saturday - Lt. Governor Ron Ramsey, former Tennessee Senator Jim Bryson, current Tennessee Senator Jim Tracy, future Tennessee Senator Mike Faulk, blogger (and proxy SEC member for the day) Adam Groves, National Committeeman Van Hilleary, and SEC members Steve Buttry (Knoxville), Jerry Sharp (Newcomb), Christi Cross (Paris), Mary Littleton (Dickson), and John Ryder (Memphis). Turnout was huge, especially amongst non-SEC members. One reason was the number of members of the General Assembly turning out in support of the new regime. I suspect that others may have been positioning themselves for one of the many staff spots in the TRP that have suddenly opened up over the past few months. Several budding GOP candidates for the General Assembly in 2008 were present. I suspect that at least two of those will be in the General Assembly 18 months from now. Van Hilleary's children are adorable. He told me about how touched he was to return from Minneapolis last this past week (where the RNC had been meeting) and have his oldest daughter run out to meet him as soon as he pulled in the driveway. You could tell that it really left an impression on the man. And I am guessing that memories like that will continue for Van and Meredith, as it is my understanding that another Hilleary child is on the way. Congratulations! In talking with several SEC members, I believe geography (with Rial coming from West Tennessee and Hill being further east than Robin Smith's Chattanooga) played a very large roll in selection of the Vice Chairman. I had fun playing with Adam Groves iPhone. Yes, it truly is one cool gizmo. DAVIS: So, are you ready? DAVIS: No. I mean (pointing at Angela's stomach) are you ready? It's time for a bit of personal reflection. I have been about as stressed as I can remember in recent weeks. Between coordinating and effectuating a move to our new house, having the closing nearly fall apart only hours prior to its scheduled time, orchestrating the sale of our old house, watching after my more-pregnant-by-the-day wife and Boston Terrier (who is quite confused as to his new, bigger surroundings), making the necessary purchases for the home (new TV, washer & dryer, lawnmower, etc. ), and all the while trying to keep the Firm from imploding has been quite a test. But the light at the end of the tunnel is approaching. Things are starting to slowly come into place at home. The old house should close next week. We're one living room suit and one dining room table from having the new house completely furnished. And it only took one all-nighter at work this week to help me get caught up at the office. (It's amazing what a little Trans-Siberian Orchestra and actually seeing folders being filed can do for your spirits at 3:00 A.M.) Angela and I are looking forward to a nice trip to Nashville on Saturday for the Republican State Executive Committee meeting. Sharon Cawood, wife of former Knox County Commissioner Mark Cawood, has resigned from her county job with the juvenile court clerk's office. No word yet as to which Knox County Commissioner's relative will take her place in the clerk's office. How does this play with the majority of Americans - particularly those in Ohio, Florida, Virginia, and other swing states - when we get to the general election? Doesn't it appear that the Democrats are the party of gay marriage?